The Ryman Auditorium is well-known as the Mother Church of Country Music and a generation ago the venue was almost the exclusive environs for that genre of song. Fast forward a few decades and Music City has opened its arms to a much broader spectrum of playing made indicative by Generation Axe that assaulted the legendary room on April 27, 2016. 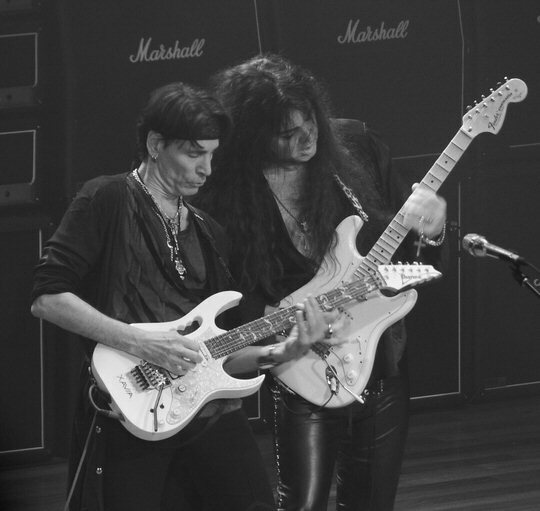 Founder Steve Vai and Yngwie Malmsteen at Generation Axe in Nashville. This tour is the brainchild of the six-string wizard Steve Via who has brought together five of the heaviest players to have ever picked up the instrument for a punishing night of licks, riffs and raucously loud music thanks to a substantial stack of Marshall amplifiers. The show got underway as all five of the stars – Steve Vai, Zakk Wylde, Yngwie Malmsteen, Nuno Bettencourt and Tosin Abasi – came out swinging seemingly determined to knock the poor Ryman to the ground with their barrage of notes and noise with a Boston cover that served as “Foreplay” for the night of guitar ecstasy. The mostly male near-capacity crowd were on their feet early and often as the Mother Church was transformed into a palace of heavy metal heaven. Yngwie Malmsteen at Generation Axe in Nashville. 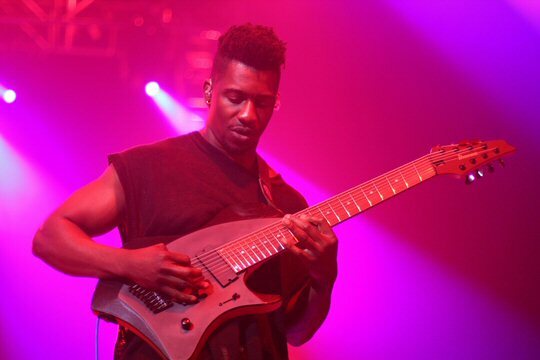 Tosin Abasi, guitarist for the American progressive metal band Animals as Leaders, was first in the spotlight playing several complex and intricate numbers on an eight-string guitar. His set was well received and stocked with stripped down versions of his band’s songs including “Tempting Time”, “Air Chrysalis”, “The Woven Web” and “Physical Education” but the guitar workout was only just beginning. 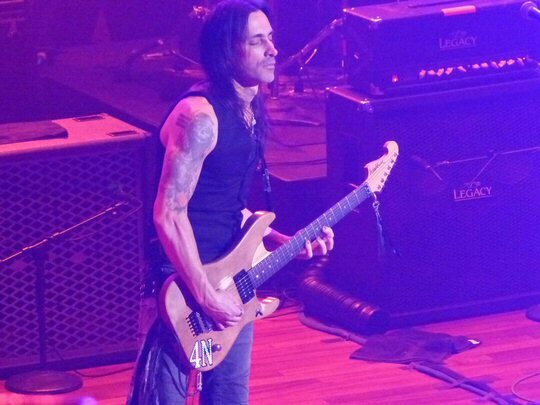 Nuno Bettencourt of Extreme fame was personable and proficient during his segment joking about how the players in Generation Axe were charging the evening’s promoter by the note. He opened with the funky “Get the Funk Out” showcasing his vocals and chops. “Midnight Express” and “Flight of the Wounded Bumblebee” followed before he switched to an acoustic for a fan-inspired Extreme medley with only a short tease of that band’s biggest hit “More Than Words”. He finished up by inviting the Wylde man to the stage to tackle “Sideways” a Citizen Cope cover with Zakk on vox. Zakk Wylde at Generation Axe in Nashville. 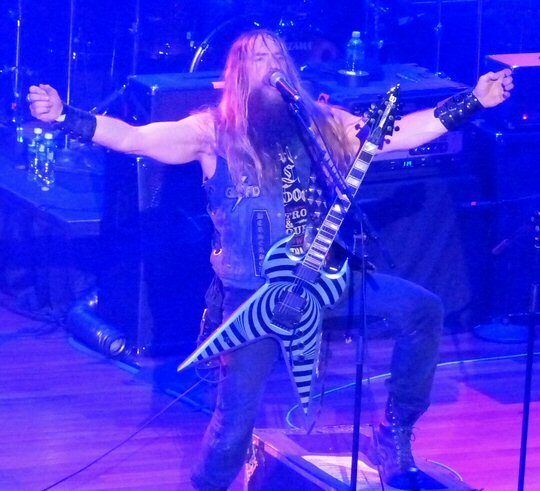 Zakk Wylde, the axeman who once looked more like Randy Rhoads but has recently morphed into the mountain man of the genre, quickly took over and owned the Ryman stage. This was to the extreme pleasure of the hundreds of fans in the crowd who were decked out in Black Label Society and Ozzy Osbourne attire. He kicked off his time with the timeless Black Sabbath classic N.I.B. Next was a tribute to his southern rock inspiration the Allman Brothers and their “Whipping Post”. This had us thinking about that strange night in musical history when Zakk performed a whole show with those legends. Speaking of legends, Zakk reprised his romp through the audience that he did two months prior in Nashville with Experience Hendrix as he took flight again with his amazing and uplifting version of “Little Wing”. He was quite the showman. The showy Yngwie Malmsteen emerged from the haze of smoke and darkened lighting and quickly put his arrogant antics on display. On the one hand was the sights – the constant flippant flipping of the hair, the flicking of the picks, and the guitar hoola hooping – that actually detracted a bit from the enjoyment of his performance. On the other hand, the sounds of his incredible technique – including four and five octave arpeggios, pedal notes, and harmonic minor, diminished and Phrygian scales, flawlessly delivered at mind-boggling levels of speed and clarity – clearly unveiled his musical genius. Together, these two facets of the man as shown during his set of “Allegro Mastoso / Icarus Dream Suite Op. 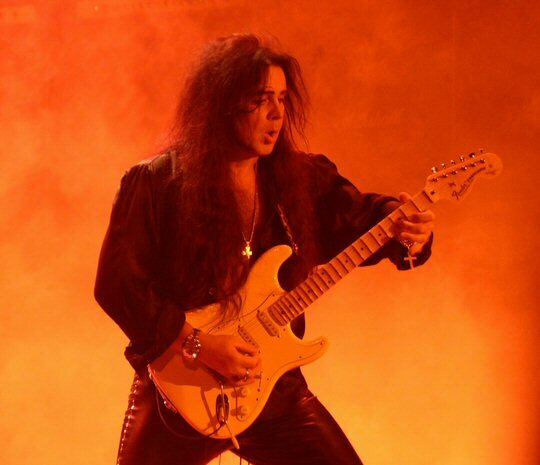 4 / Far Beyond the Sun”, “Trilogy Suite Op: 5”, “Black Star” and several acoustic and electric forays – artfully and succinctly revealed the enigma that is Yngwie Malmsteen. Steve Vai is one of the most in-demand, versatile, eloquent and soulful guitarists in the business and has toured the world as a solo artist, a member of G3, and with Frank Zappa, Alcatrazz, David Lee Roth, and Whitesnake. 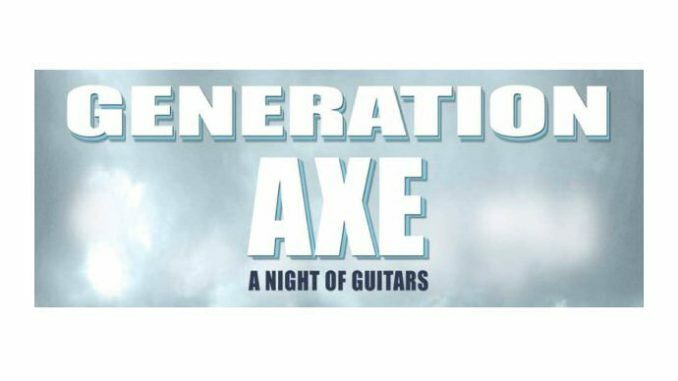 Generation Axe is his baby and by the response seen in Nashville it was quite a good idea to gather this caliber of talent together for a tour. The host came back out nearly three hours into the night and delighted with his clean and crisp and technically pure playing as featured on “Now We Run”, “Tender Surrender” and “Gravity Storm”. He closed his set with “Building the Church” – perhaps a nod to the building he and his cohorts did their damnedest to destroy on this evening. Nuno Bettencourt at Generation Axe in Nashville. “The Generation Axe show is a unique performance of five fiercely talented guitar players coming together to create a 6-string extravaganza that is sure to amaze and delight,” commented Steve Vai at a press conference in advance of the tour. Sure enough, they all delivered especially as the stars reconvened to offer an all-out axe attack on the classic rock favorites “Frankenstein” and “Highway Star” that brought the ear-splitting and highly entertaining guitar event of the year to a close. The Ryman Auditorium in Nashville is the Mother Church of Country Music but she continues to showcase a wide array of artists such as the genre busting Generation Axe. The venue reflects its history with wooden pew seating paired with modern lighting and sound. Some consider it one of the finest sounding rooms in the States. Upcoming events at the Ryman include Bonnie Raitt, Paul Simon, Mudcrutch and Ringo Starr. Tosin Abasi at Generation Axe in Nashville.